My classic american buttercream recipe is my top blog post, and is also my most frequently requested recipe! While I feel comfortable swapping in and out ingredients to make different flavors using this base recipe, I realize that you guys might want to know the recipe for my frequently used variations. When it comes to buttercream (and baking in general), I always like to keep things simple! While there are tons of delicious types of buttercream out there (Swiss, German, Italian, French…), I prefer American Buttercream! Why? I don’t like to mess with eggs when it comes to frosting, and I enjoy the way American buttercream tastes. I find I’m disappointing when bite into a cake with Swiss meringue buttercream (SMBC). SMBC is much lighter and less sweet, and it leaves me feeling unsatisfied. This is just my personal opinion! It’s definitely the sweetest type of buttercream (Duff Goldman calls it sweetened butter :P), but I grew up eating sweet icing, and have always had a huge sweet tooth!! I grew up loving pop tarts, cans of sugary frosting, and fruity candies! If you didn’t grow up eating American sweets, or if you don’t have a big sweet tooth, this frosting recipe might be too sweet for you. However, I do find that my chocolate buttercream tastes a bit less sweet than my vanilla buttercream. If you’re looking for a rich chocolaty cake filling, or a something that is chocolaty but a bit less sweet, I highly recommend trying ganache! The cake below is covered in milk chocolate ganache, and it is a really great alternative to chocolate buttercream. So here you have it, the recipe for my second most popular flavor of buttercream -CHOCOLATE! It takes my vanilla buttercream recipe, and adds in baking cocoa, and a touch more heavy cream to balance out the thickening effect of the cocoa! You can also add more cocoa if desired, to get a stronger chocolate taste. Just be sure to add in more heavy cream as well, to maintain the consistency of the frosting. This frosting is just as easy to make as my vanilla buttercream, and is a dream to frost cakes and cupcakes with. When using this to frost my favorite vanilla layer cake recipe (which can be used to make four 7 inch or 8 inch cake layers), I usually make 1.5 – 2 batches, depending on how I’m decorating the cake. NOTE: If you are making frosting for a cake, it is important to mix the buttercream on low at the end of the process for a couple minutes, to get out any extra air that might have be incorporated during the mixing process. 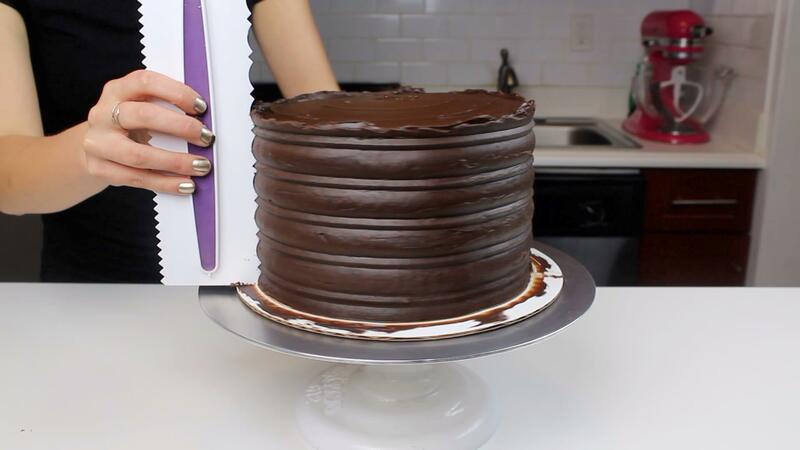 This will make it easier to get super smooth sides on your cake! This chocolate buttercream recipe is so easy, you'll never buy store bought frosting again!! It's made with only 6 ingredients, and takes less than 10 minutes to make!! Add in the cocoa, and mix on low until the cocoa is fully incorporated, and no clumps remain. Once fully mixed, add in the vanilla and salt. 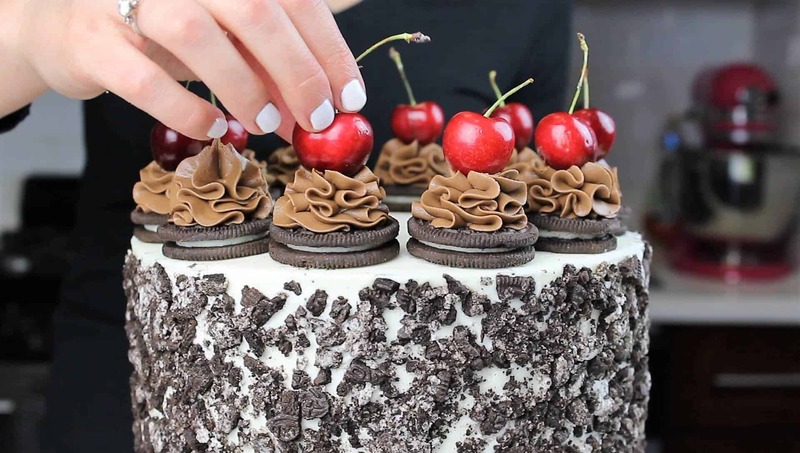 I was wondering if this will taste like an Oreo like your black buttercream does? I tried it this past weekend and it was amazing! I was looking for a similar taste but not black. Thank you! Thank you! It’s so good! Hey Chels! I’m making your frosting for my daughters birthday! Do you bake your cakes the freeze or chill them over night then frost next day? Or do you make,bake, and frost all same day? 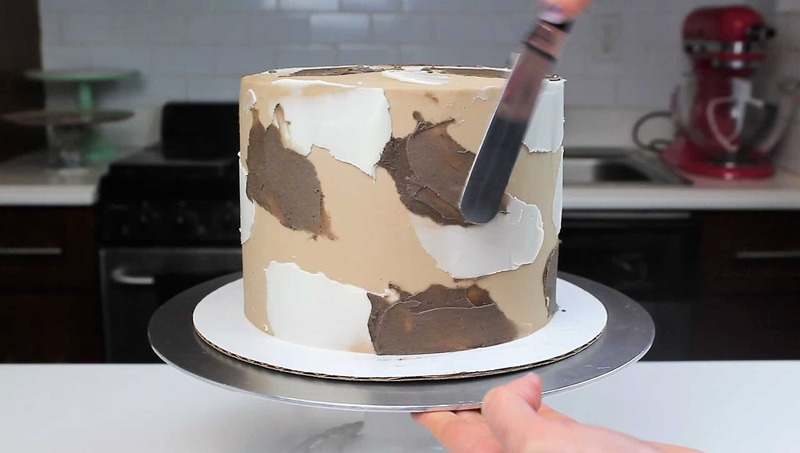 Also do you chill your frosting at all before applying to cake? THANKS! I am making this tomorrow for sure! Thank You ??? I’m trying to make Black Buttercream to decorate 200 mini cupcakes and saw you ganache information. After trying to make different buttercream recipes black and being disappointed with either texture or flavor I’ve become very stressed. Now I think after reading your article on ganache I could make dark ganache and add Americolor Super Black gel and keep it at a soft consistency for decorating the mini cupcakes. I live in a hot climate so I don’t leave anything on the counter over night. Do you think the soft consistency will pipe well on the tops of a mini cupcake and hold under refrigeration over night without any problems. Since I’m doing 200 I mini cupcakes I need to know what’s going to work and what’s not. I plan on leaving the ganache sit for about 3 hours on counter til it becomes pudding like consistency and then start piping. Can you please tell whats the substitute for heavy cream in this recipe? you can use heavy whipping cream, or whole milk! How many batches would we need to make for a 4 layer 8 in cake (I plan on using your chocolate cake recipe). If frosting cupcakes and there will be no refrigeration available can these cupcakes sit out all afternoon? Hi, I made this buttercream (deliscious), but I had so many air bubbles. Any suggestions? I’d say use freeze dried strawberries, or a strawberry puree reduction! Hi Chelsea! I made the Bailey’s cake for St. Patrick’s Day. My chocolate buttercream was a little darker than yours and I didn’t get the nice contrast between the butercream and ganache. What brand of cocoa do you use? I used Ghirardelli baking cocoa, and melted chocolate! Thanks for the reply. The cake was delicious! Looking forward to trying some of your other creations.